This screen is very easy to set up, although as the sockets are located in a recess on the back panel, we did have to spend some time bending our HDMI cable into a shape that could be plugged in easily. Disconcertingly, the screen displayed an 'HDMI no input' sign, even though the television was hooked up to a Blu-ray player, but this message vanished once the disc player had booted up fully and the TV recognised it. The set's selling point is its HDMI port, which is joined by Scart, composite and S-video sockets, alongside a PC input. With its resolution of 1,024 x 768 pixels, the panel has a fairly low contrast ratio of 500:1, and a brightness level of 500cd/m². We were surprised to find there is no digital TV tuner as this is becoming standard as the switchover approaches, so you'll need to get a set-top box if you want Freeview. The remote control is light and comfortable and the most frequently used buttons are easily accessible. Using a standard DVD, colours did appear somewhat muted, and there was a fair amount of blurring, even on moving images. Blacks looked positively charcoal and there was little definition in the darker areas of the screen. 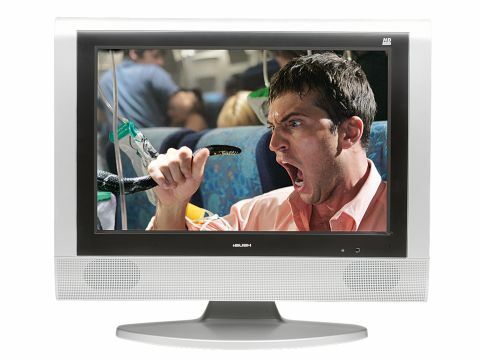 This was also the case when viewing TV pictures using the set's analogue tuner. Using a Blu-ray Disc, pictures become much more detailed, while colours take on more vibrancy. There is, however, still a significant amount of smearing, even on relatively slow panning shots. There's also a marked improvement in black levels, although this is still far from perfect. Four picture preset modes are easy to scroll through, but oddly, they don't match up with the modes listed in the manual. When viewing an animated movie, such as the Blu-ray version of Tim Burton's Corpse Bride, the screen seems to perform better, potentially making it better suited for the kids' bedroom, especially due to its size and sound limitations. The audio is reasonable, but it can sound tinny as the volume is increased. There are four audio modes, a couple of which flesh out the sound, but which on the whole make little difference to the output. Inevitably, hi-def pictures do suffer on a mini screen, but then we didn't expect to be blown away.